Welcome back to our November 2008 issue #006 of Bangkok Travelbug. November is a far happier month. We get to observe one of the most colorful delights in the Thai cultural calendar, the Loy Krathong Festival on 12 November. You did an outstanding job with this newsletter. I enjoyed reading it very much and the photos were just great. Looking at the before and after pictures reminds me of when I was there and I just can't believe the looks in the new pictures. All I can say is Wow! What a change. 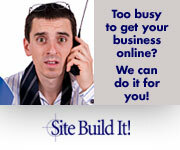 You need to be complemented on the work you do with the blog, newsletter and website. Thank You. The Loy Krathong Festival is a 13th century Sukhothai tradition of Hindu origin, adapted to Buddhism. This colorful annual festival is celebrated nation-wide to give thanks to the Goddess of Water and to seek forgiveness for past misdeeds. Hindus release floats on the river in the belief that the river will carry these floats to the Ocean of Milk where Vishnu resides. For Buddhists, this occasion commemorates the visit of Buddha to Naga where he left his footprint on the river bank. The common belief is one of thanksgiving to the Goddess of Water. 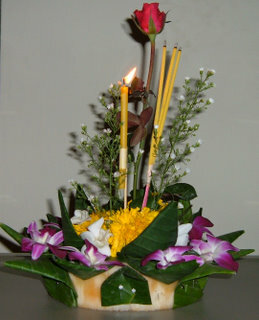 The krathong symbolically carries away bad fortune as we wish for better things to come. The festival is also celebrated in Cambodia, Laos and certain parts of Myanmar. This tradition is particularly strong in agricultural societies where the river gives life and sustenance in a close bond between Man and Nature. To the millions of farmers dependant on its source of water, the Chao Phraya is the river of life. The festival is on the 15th night of the new moon in the twelve-month of the lunar calendar, usually in November. This year Loy Krathong is on 12 November. 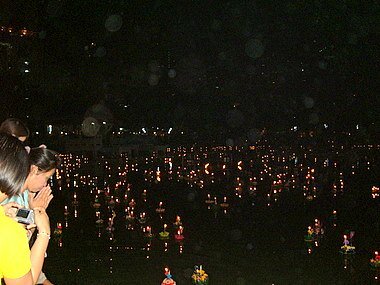 In the ritual, the person kneels by the water, says a prayer, makes a wish, asks for forgiveness and floats (loy) off the lighted krathong. Courting couples float off a krathong together under the full moon and watch as the krathong drifts towards the fulfilment of their dreams. People usually bring their krathongs out to float. I brought mine home, to take it apart and find out how it’s made. Traditionally, krathongs are made entirely from natural material; a small slice of banana trunk to serve as the float, which is decorated with banana leaves, multi-colored orchids, lotus and bright yellow marigolds, a candle and three joss sticks. Sharpened wooden slivers are used to pin the leaves. It's customary to leave some coins and a strain of your hair in the krathong to bring in good fortune and carry away the bad. In recent years, Styrofoam has replaced the banana trunk and nails and staples are used instead of wooden slivers. The authorities are discouraging the use of Styrofoam, so some creative people have resorted to specially baked loaves of bread which are removed quickly by the fishes. In Bangkok, there’ll be a lighted float procession on the Chao Phraya River between the King Rama IX Bridge and the Krung Thon Bridge every evening from 8 – 12 November 2008. Here are accounts of Loy Krathong Festivals in previous years. 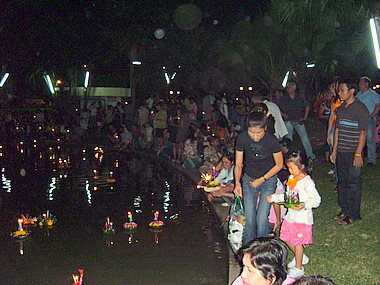 Loy Krathong Festival 2005 gives the historical and cultural background to the festival. 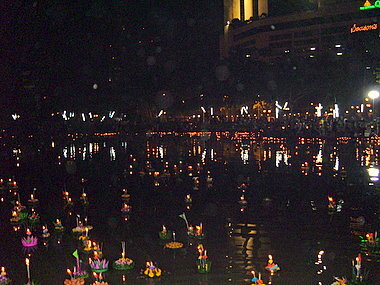 Loy Krathong Festival 2006 was marred by floods in many parts of the country, including parts of Bangkok. Loy Krathong 2007 gives a sample of the festival in three different parts of Bangkok. We’ll bring in photos of Loy Krathong 2008 in next month’s issue. 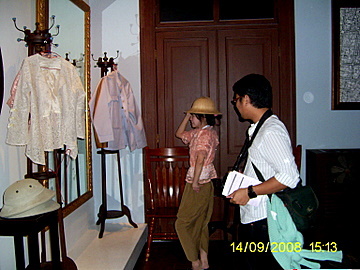 Museum Siam is the latest addition to the list of more than 180 museums in Bangkok. Housed in the former Ministry of Commerce building in the old city, this new museum covers more than 2,000 years of Thai history from the Bronze Age to the present. However the presentation of exhibits here is a refreshing change from the static displays of the conventional museums of the past. Interactive audio visual media encourages self discovery by visitors at a touch of a button or screen on small terminals or large interactive digital maps. 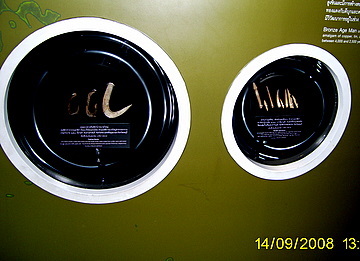 Some exhibits can even be handled by visitors. Here’s a preview of some of the exhibits. Prehistoric relics found in Lopburi province, 200 km north of Bangkok. 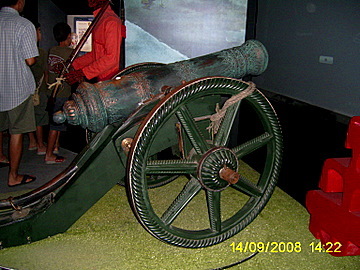 This old cannon actually “fires” a cannon ball! Chinese junk and European ship calling on Ayutthaya. You’re welcome to try on some of the display items, like this young lady here. 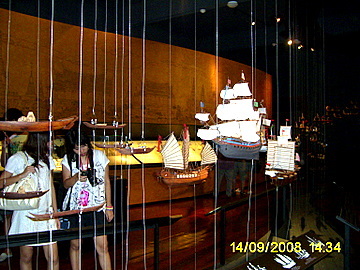 For a very different museum experience, find out more about the displays at Museum Siam. 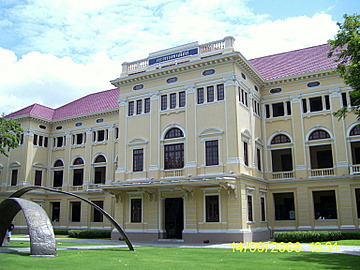 To get there, please refer to the Museum Siam map. In 1950 during the premiership of Field Marshall Plaek Phibun Songkhram, the completion of a road marked a milestone in Thai highway construction. The road starts at about 300 m east of what is now the Ploenchit skytrain station and stretches all the way to the outskirts of the city. It continues on through the south-eastern provinces of Samut Prakarn, Chonburi, Rayong, Chantaburi, until it finally ends at Trad on the Cambodian - Thai border! The man responsible for this highway, the 5th Director-General of the Highways Department, was the first Thai to graduate from the Massachusetts Institute of Technology, USA. His name was Phra Phisan Sukhumvit and the road? Yes, you guessed it, Sukhumit Road, named in his honor. Sukhumvit Road hasn’t got any longer but the list of hotels in downtown Sukhumvit has. Just take a look at the hotels in Sukhumvit. We’d love to hear to hear comments, ideas and feedback from you. Please tell us what you think. Contact us at this link, E-mail-us.